After a specialist determined Ethan’s retinas had detached, we took him for surgery to attempt to re-attach them. One month later, we were told the surgery had not been successful and were offered a rather stark idea of what Ethan might be doing. With a gift from my grandmother, I was fortunate to be able to leave my full-time job. I wanted to be completely involved in Ethan’s educational and developmental early intervention program, which began in our home when Ethan was three months old. Fortunately, our first teacher of the visually impaired (TVI) was wonderfully forthright, assuring us with an easy air that Ethan would naturally be a reader because my husband and I are avid readers. We were, to say the least, a little daunted. We set out to learn all we could about Braille though, and were completely astounded to learn what would come to completely change our lives: as few as 10% of people who are blind or visually impaired actually read Braille. We wondered what the other 90% were doing to deliciously pass free time on a summer evening, or how they applied for jobs, or read to their children or grandchildren. We soon found out many people who are visually impaired are told to, “Try a little harder,” to read print, or that older people who’ve lost all or most of their sight think they are too old to learn. One man I spoke to was actually told by a professional rehabilitator, “You won’t learn Braille until you’re totally blind,” which he of course, believed. A professional should know, right? When Ethan was first receiving TVI services we didn’t realize, but quickly learned, not all professionals in the blindness community have the same philosophy about teaching Braille pre-reading skills to infants and toddlers as our first teacher. When Ethan was about two and a half years old, we asked when Braille books were going to be used during his class times. Our highly-regarded teacher replied, “Oh, Ethan’s too young to start Braille pre-reading.” When is any child too young for reading? With all of this in mind, in 2001, when I began making and selling fashion jewelry, I soon noticed many items (most mass-produced) incorporated Balinese-style, almost Braille-like beadwork called granulation. 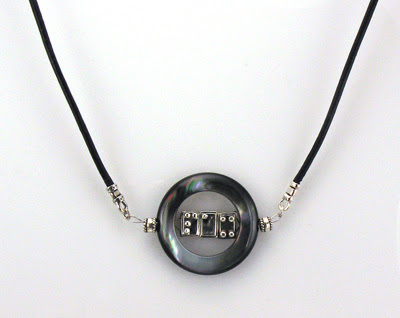 Since Ethan was immersed in Braille for his first year, it was always around us and I started thinking about creating a fun, funky line of Braille fashion jewelry. I knew other lines of Braille jewelry were being designed, but I wanted something different; something that seamlessly combined the aesthetics of design and the functionality of Braille so that people would be as interested in and attracted to it as they are to jewelry or fabrics with Asian characters or 18th century French script. I wanted to offer pieces anyone would want to wear. After several failed attempts at transferring design ideas via telephone and Internet, I flew to China in January 2002 and had 2000 of the world’s first mass produced Braille heart pendants manufactured and sent just before Valentine’s Day. She makes beautiful pieces of art, and I love their purpose. I was also very surprised to learn that only a small percentage of people who could benefit from knowing Braille actually do learn it. I had never considered learning Braille at an older age in order to preserve the ability to read after a person’s sight declines. Very cool story. Those alphabet beads are so neat. My grandfather is slowly losing his eyesight and he’s a very big reader, so for the past few years he’s been collecting audio books for the inevitability of not being able to read books anymore.